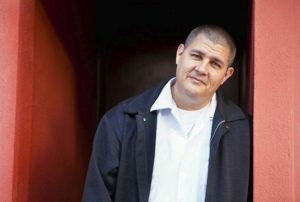 Adam Johnson is a novelist and short story writer whose newest story collection, “Fortune Smiles,” won the 2015 National Book Award. His 2012 novel The Orphan Master’s Son, won the Pulitzer Prize. Johnson is an associate professor of English at Stanford University. Johnson began writing about North Korea out of an interest in the language of propaganda. For The Orphan Master’s Son, Johnson researched North Korea for three years, relying on scholarship as well as first-person accounts from survivors of the country’s dictatorship, such as defector Kang Chol Hwan, who was imprisoned for ten years as a child in the Yodok concentration camp. Johnson visited North Korea in 2007, but because contact with foreigners is illegal for North Korean citizens, he was unable to interview them. This research and imagination led to two main narratives in the novel, the first about an orphan named Jun Do who serves the state as a kidnapper, and the second about Jun Do’s assumed identity as the national hero Commander Ga. The novel reveals the struggle between personal identity and the propaganda of a dictatorship. In addition to winning the Pulitzer, The Orphan Master’s Son was named one of the best books of the year by publications such as The Washington Post, Entertainment Weekly, the Los Angeles Times, and The Wall Street Journal. For the title story of Fortune Smiles, Johnson returned to his North Korean subject matter. The story follows two North Korean defectors as they try to navigate their new lives in Seoul. One is optimistic about his new life in the South, while the other is having difficulty adjusting, as he pines for a woman he loves back in the North. In addition to the Pulitzer and National Book Award, Johnson also has won Guggenheim and National Endowment for the Arts fellowships, a Whiting Writers’ Award, and a Stegner fellowship. For his story “Nirvana,” he won the Sunday Times EFG Private Bank award, known as the richest short story prize in the world. Other books by Johnson include the story collection Emporium and the novel Parasites Like Us.